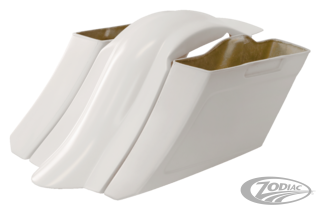 These Zodiac Exclusive fiberglass saddlebag lids are made in Holland in precision build moulds by Double G Baggers. They fit stock and aftermarket hard shell luggage on 1993 thru 2013 Touring models and are ready to take 6 1/2" speakers. Lids, hinges and latches are not included. Parts come with a white gel coat finish, ready for your painter's preparation but make sure to check and test fit prior to painting. Zodiac will not be responsible for any damage sustained to paint jobs. These Zodiac Exclusive fiberglass saddlebag bodies are made in Holland in precision build moulds by Double G Baggers. They are a perfect replacement for the stock hard shell luggage and are 6" (15cm) longer at the underside to provide an unparalleled stretched look. Lids, hinges and latches are not included. 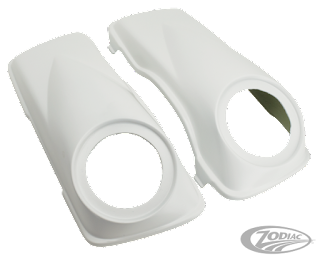 Bags for 1993 thru 2008 models come complete with a matching rear fender cover, bags for 2009 thru 2013 models come complete with a full rear fender. All parts come with a white gel coat finish, ready for your painter's preparation but make sure to check and test fit prior to painting. Zodiac will not be responsible for any damage sustained to paint jobs.